All give the Fantastic an embodied form. Monstrosity was experienced in the age of the marvelous as prodigious, thus retaining the key emotional componenet of awe. Later, under the influence of medical emperimentation and enlightenment science, research assigned the freak a rational category, but without eliminating the new and complex component of dread. 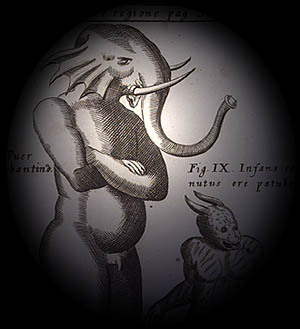 Hybrid creatures no longer inspired the amazement of the creatures of ancient myth. As teratology begins to catalog monsters for the age of reason, literature gives them voice. Boneson, A Cabinet of Medical Curiosities. Ithaca: Cornell University Press, 1997. Charcot: Les Difforne(accute)s et les malades dans l'art. Reprint, Amsterdam: B.M. Israel, 1972. Lorraine Daxton, Katharine Park. Wonders and the Order of Nature, New York: Zone Books, 1998. Feher, et. al. Fragments for a History of the Human Body.New York: New York: Zone Books, 1987. Gould, Anomalies and Curiosities of Medicine. Philadelphia: W.B. Saunders, 1900.